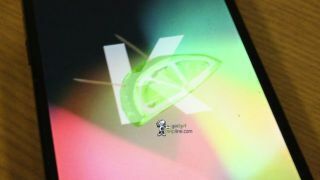 Some snaps purportedly showing Android 4.4 KitKat in action have surfaced, giving us a glimpse at possible new features due with the next 'droid flavor while reminding us of the Key Lime Pie that isn't ready to be served. Gadget Helpline (via Android Authority) posted 21 shots of a Nexus 4 running 4.4, though it's important to note there's no way to confirm what we're seeing is the real deal or if these are indeed looks at KitKat itself. The build is identified as Key Lime Pie, the name formerly assigned to Android KitKat and still possibly reserved for Android 5.0. This should come as no surprise since Key Lime Pie was used as an internal codename for KitKat to avoid leaks. You'll notice the "K" and lime slice Easter egg plopped on this phone's rainbow backdrop, but again, don't let this citrus symbol fool you. According to Gadget Helpline and based on these grabs, there aren't a whole lot of drastic cosmetic changes between KitKat and Jelly Bean. The notification buttons are apparently white, not blue, while white is also prominently featured in the Dialer app. Mercifully, there's more to 4.4 than some "it brightens up the room" splashes of white. The screenshots show off a new Settings menu option for "Printing," replete with all the controls you need to push out a printed something from your device. It seems as though users can access it from the Gallery and other apps like QuickOffice. QuickOffice, by the way, appears to sync with Google Drive here, while both apps plus Keep are part of the Android 4.4 package. There's also an option for Payments and Wireless Display within Settings, and a Manage Mobile Plan trigger located within Wireless and Networks. In the Gallery, the leaked images show some new photo editing prompts (Tilt-Shift, Center Focus, Negative and Posterize) plus an "adjustable quality slider" that gives a glimpse at the final versions of images. Users worried about personal info seeping into the ether when connected to a personal hotspot should note Android 4.4 apparently has an optional feature to prevent mobile data use in just such an instance. Mysteriously, this device's About Phone section has the word "Hammerhead" roaming about, the codename we've seen pop up recently in relation to the Nexus 5. Hypothesis? We're due for a KitKat breakthrough when the new Nexus likely launches later this month. Have a hankering for a new Android 4.3 tablet? Check out our Nexus 7 review to satiate your appetite.